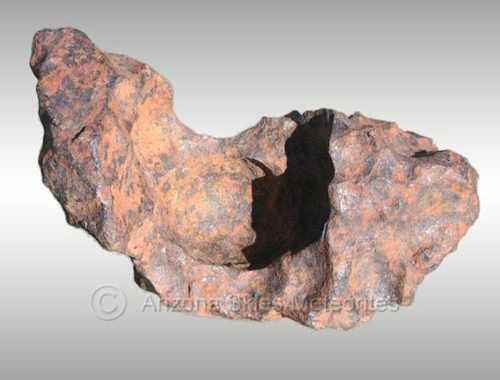 Photo of a Classic Iron Meteorite with Natural Patina and numerous indentations or "thumbprints". 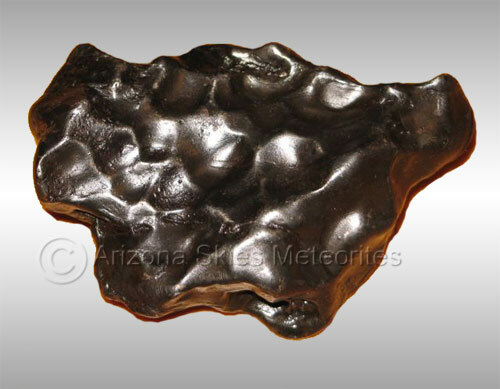 Welcome to Arizona Skies Meteorites® Meteorite Identification page. Over the years we have received literally hundreds, maybe even thousands of emails from people that were sure that they had found a meteorite. Unfortunately, out of all these suspected meteorites only few were actually real meteorites. How can one identify a suspected meteorite? 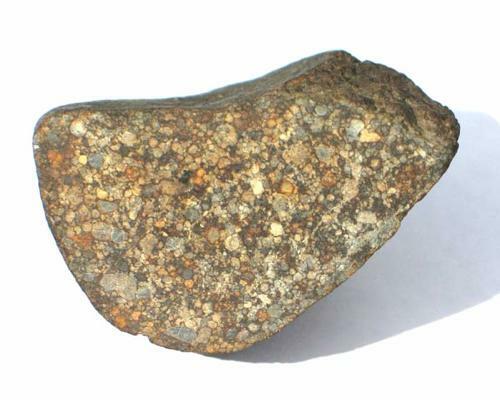 We have developed this webpage as an introduction to meteorite identification. We recommend looking at a lot of photos of the real meteorites on our website. This will help you get a feel for what real meteorites look like. After you have done that, a little background information will be helpful. Meteorites come in several distinct types. There are iron meteorites, stony meteorites (chondrites and achondrites) and meteorites that are a mixture of the two, stony-iron meteorites (pallasites and mesosiderites). The vast majority of all meteorites are stony meteorites known as ordinary chondrites. 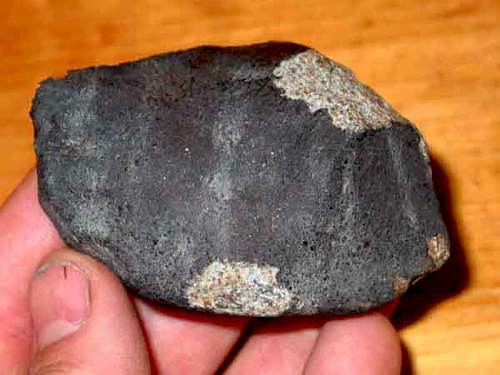 If you have found a real meteorite, it is most likely an ordinary chondrite. Ordinary chondrites come in all shapes and sizes. Here are some Chondrite Photos. Some are so weathered that they look like an ordinary terrestrial rock while others are so fresh that they look like a charcoal briquette. Chondrites typically have some sort of fusion crust on their exterior and often contain tiny metal flecks made of an iron-nickel alloy which will cause magnets to be attracted to them. Chondrites, by definition, also contain a few to many Chondrules (see examples below). When cut, the interior of the Weathered Franconia Chondrite shown above shows numerous iron-nickel metal flecks. These flecks attract magnets, and are characteristic of most Chondrite meteorites. Photo of a freshly fallen Oum Dreyga Chondrite. Note the black fusion crust and light interior. A freshly fallen Oum Dreyga (Amgala) H3-5 Chondrite showing a light colored matrix filled with iron-nickel flecks. This is a typical, weathered Ordinary Chondrite. Note the dark brown fusion crust and the weathered, lighter colored interior. If you are ever lucky enough to find a freshly fallen chondrite this is what it might look like. Note the fresh black fusion crust and light interior. Some non-metamorphosed Chondrites show pronounced Chondrules (the small circular objects in the above photo). Note that this type of chondrite has few metal flecks. 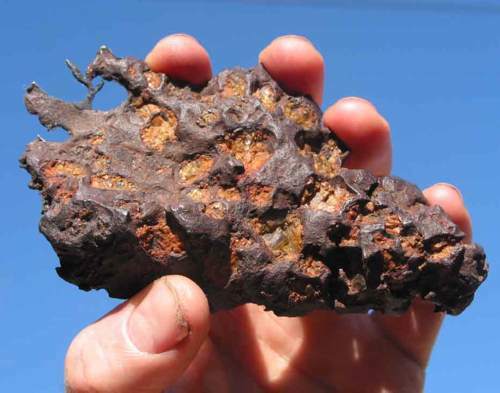 1) Look at some Iron Meteorite Photos. 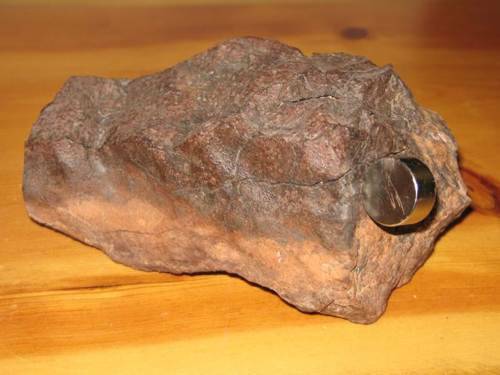 Most iron meteorites will be covered in rust and maybe caliche as seen in the Canyon Diablo iron meteorite shown above. 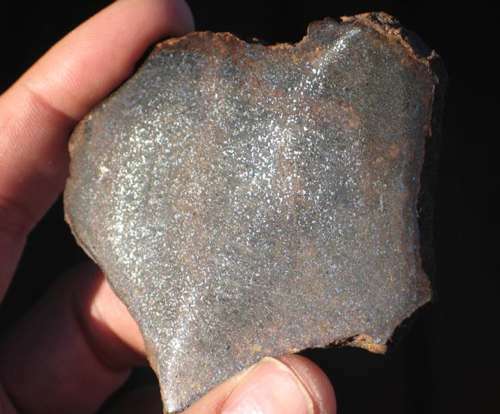 Often, iron meteorites will have indentations or "thumbprints" where parts of the meteorite were ablated during entry into the Earth's atmosphere. Occasionally an iron meteorite will be freshly fallen. 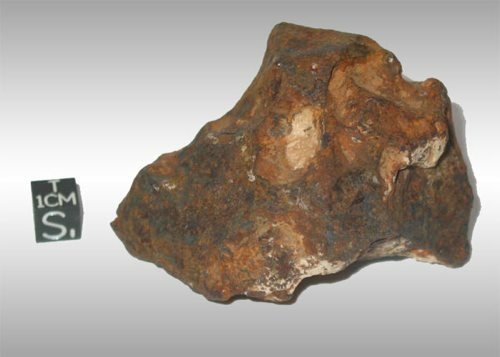 Freshly fallen iron meteorites look similar to the Sikhote Alin meteorite shown below which fell in Eastern Siberia in February, 1947. 2) Iron meteorites are never round. If it is round or spherically shaped then it is probably a cannon ball, ball bearing or milling ball. 3) Iron meteorites are not grey inside unless they are extremely, extremely weathered, in which case they have little commercial value. 4) When cut, iron meteorites are a shiny silver color inside, just like a piece of freshly cut steel. 5) Most Iron Meteorites show a Widmanstatten Pattern when cut and etched. This type of pattern is unique to meteorites. 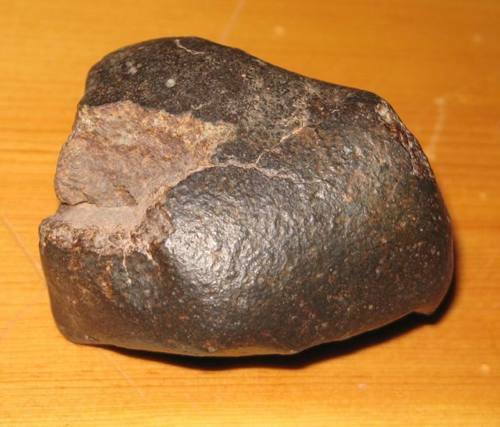 Photo of a freshly fallen Sikhote Alin iron meteorite. Note the thumbprints and smooth fusion crust. 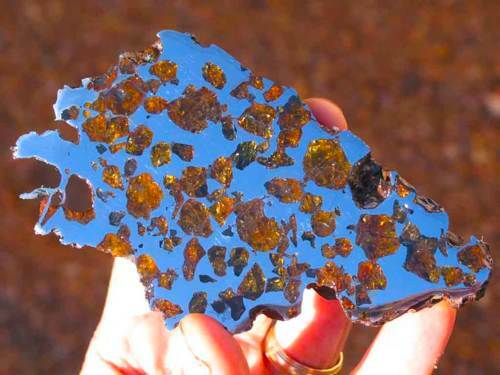 Photo of the exterior of an Imilac Pallasite. Note the olivine crystals embedded in it. Photo of the interior of the same Imilac pallasite shown above. Mesosiderites are another meteorite type that is composed of a mixture of stone and iron. They somewhat resemble a metal rich chondrite. If you have found a mesosiderite it should be fairly easy to identify. See photo below. Photo of a large Mesosiderite. The lighter areas are all iron-nickel flecks and nodules. Achondrites are a rare group of Stony meteorites lacking chondrules. Here are some Achondrite Photos. Unless your rock has an obvious fusion crust, it will require an expert and probably laboratory analysis to distinguish an achondrite from a terrestrial (Earth) rock. Many of the standard Meteorite "Tests" are, in our opinion, not very useful, often producing false positive and false negative results. The so called "Streak Test" is non-diagnostic as there are many meteorites that will leave a streak. The inexpensive dimethylglyoxime "Nickel Test" is also not very useful as it is extremely sensitive to even minute quantities of nickel and many common Terrestrial rocks will give false positives. 1) Most meteorites are attracted to strong magnets, though many common Earth rocks are also attracted to magnets. 2) Most meteorites are denser than the average Earth rock. In other words meteorites are typically heavier than Earth rocks of the same size. 3) Stony meteorites (Chondrites and Achondrites) often have an obvious fusion crust. It is not always easy for a novice to identify a real fusion crust, and many rocks found in the desert have a "desert varnish" which is often mistaken for fusion crust. 4) Chondrites often have numerous tiny metal flecks inside of them, causing them to be attracted to magnets. 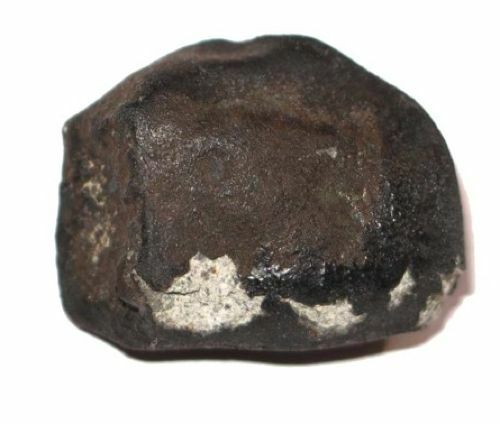 This is a characteristic that is nearly unique to meteorites. 5) Chondrites have Chondrules, although ordinary Earth rocks can also have inclusions that can resemble chondrules. 6) Iron meteorites are strongly attracted to magnets. 7) When cut, iron meteorites are a shiny silver color inside, just like a piece of freshly cut steel or iron. 8) Magnetite and Hematite are common Earth iron ores that many people mistake for meteorites. When cut, magnetite and hematite have a rather dull grey color like pencil lead inside and not the shiny silver color of freshly cut iron meteorites. 9) Most iron meteorites can be identified by etching. This process reveals the crystalline patterns (Widmanstatten patterns) that are characteristic of iron meteorites. We don't recommend trying to etch a suspected meteorite yourself as it can be very dangerous. Have an expert do it for you. 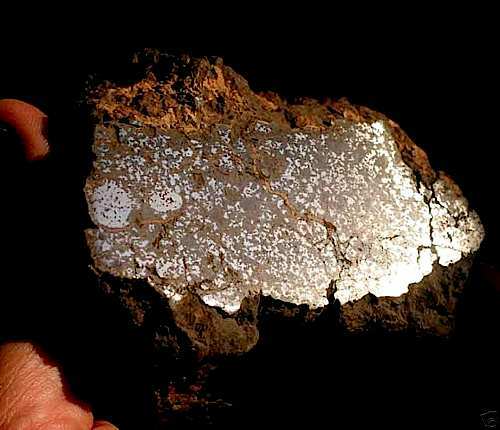 10) Except for the very rare exception, meteorites do not contain bubbles. Many people confuse common volcanic rocks such as basalts for meteorites. Basalts typically are full of obvious bubbles and tend to be rather light for their size. Basalts can also attract magnets and set off metal detectors. 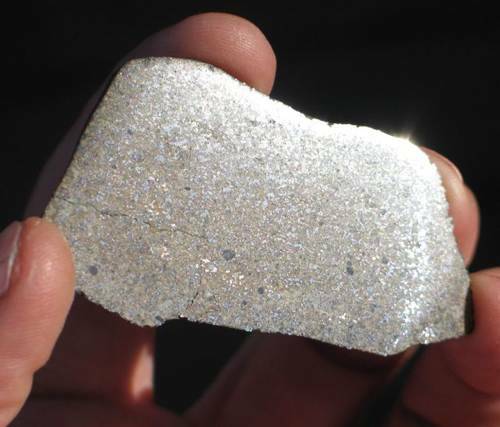 If your rock is full of bubbles it is almost certainly not a meteorite. 11) Many of the standard "Meteorite Tests" are, in our opinion, not very useful, often producing false positive and false negative results. The so called "Streak Test" is non-diagnostic as there are many meteorites that will leave a streak, giving a false negative. The inexpensive dimethylglyoxime "Nickel Test" is also non-diagnostic as it is extremely sensitive to even minute quantities of nickel and many common Terrestrial rocks will give false positives. We hope that you find this information helpful. Unfortunately, due our limited time resources and the large number of inquiries about meteor-wrongs we are no longer able to offer meteorite identification services.